There's a ban train coming, and cheaters are going to get tied to the track. But if they're quick, Rockstar says, they might just be able to wriggle free. On Tuesday, Rockstar will be cleaning house on Reed Dead Redemption's multiplayer, and "swiftly and indefinitely" booting any player it's detected using hacked save files. Rockstar is not without mercy however, and is giving cheaters one last chance to save themselves. Writing on the Rockstar blog, the developer said that in order for RDR cheaters to avoid getting smashed into a sticky banned pulp, anyone with hacked saved files would have to delete them and then go online so that the Rockstar systems can detect that they are now clean. 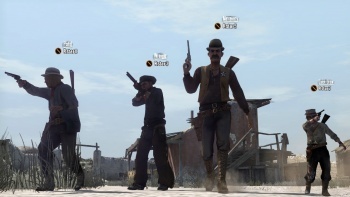 In the case of single player saves, players would have to replay the game until they reached the safehouse at MacFarlane's ranch, and for multiplayer saves, players would need to play one full game online, or do one Gang Hangout. Rockstar said that anyone who had taken advantage of temporary exploits a couple of weeks ago to grind XP would be safe, as it was only those with hacked saves that would be targeted. Rockstar warns that deleting a save means that literally everything is removed, but that any pre-order bonuses or cheats they had earned through the Rockstar Social Club would be recovered when they started a new save. Those who fail to delete their saves and do get banned will be unable to play online and will have their names stricken from the leaderboards. I have to say that the way that Rockstar is handling this situation is pretty neat, as anyone who does get banned really only has themselves to blame. No one can say that Rockstar isn't giving them a chance to change their ways when it is literally giving them a chance to change their ways.